Ever since private players got the nod from IRDAI to operate in India's general insurance sector in 2000, they went from strength to strength. Gone are the days, when consumers were solely dependent on PSUs for their insurance requirements. However, with each passing year the paradigm is on the turn, especially with the emergence of online transactions in India. It well and truly remains a million dollar question, whether you should put your trust in a century-old public insurer or a newly emerged tech-savvy private insurance firm to fulfill your insurance needs. However, according to recently revealed stats, private insurance companies are gaining prominence in India's general insurance landscape at the rate of knots. A whopping 16% growth, from Rs 12,206.42 crore to Rs 10,528.72 crore in Gross Direct Premium is witnessed by non-life insurers in India up to April 2017. 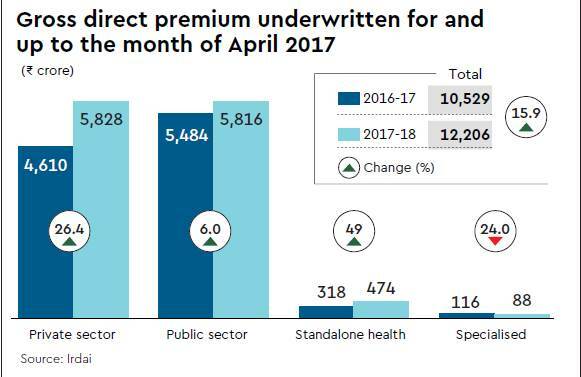 As the situation stands in April of 2017, four insurers from public sector boast a total 47.65% market share and 18 insurers from private sector have 47.75% market share. While the market share of insurance companies from public sector and private sector are almost the same, the rate at which private general insurance companies in India are expanding is noticeable/praiseworthy. Private insurers received a total gross direct premium worth Rs 5,828.06 crore and showed a tremendous growth rate of 26.43%. The insurers belonging to public sector grew at just 6.04% and received Gross Direct Premium worth Rs 5,815.84 crore. Only two public sector insurers such as New India Assurance and National Insurance managed a decent growth over 12%. While Oriental Insurance saw a negligible 1.34% growth, United India Insurance didn't see any growth at all in terms of Gross Direct Premium as its growth rate was declined by 4.90%. These stats pinpoint the fact that, Indian consumers have come a long way from their unquestioning faith in public insurers and are resorting to private insurance houses in India to make the most of the advantages they offer and reliability they have earned. For decades, Indians have been putting unquestioning faith in public sector organizations and have always had an element of doubt while dealing with private companies. Private General insurance companies came into existence back in 2000 and are now performing really well in India's general insurance market. If you are unsure about reliability of private general insurance companies in India like ICICI Lombard, Bajaj Allianz, here are some pointers for you. All private general insurance players including private insurers are under the jurisdiction of IRDAI and follow strict guidelines. Since IRDAI always prioritizes interest of the consumers rather than that of companies, you can trust private insurance firms like ICICI Lombard and can rightfully seek to resolve any discrepancy. It is far from being easy for insurance companies to get license and start doing business in India. IRDAI requires a mammoth start-up capital as new players since 1999 had deposited a staggering Rs. 100 crore to kick-start their operations. In recent times, one has to shell out at least double of this amount to commence insurance business in India according to IRDAI. This is why, only companies with immense financial strength can set their foot in India's general insurance market. All insurance companies in India regardless of whether it belongs to private or public sector need to maintain 150% solvency margin. In simple words, if a company insures Rs. 100, it must have Rs. 150 in reserve. IRDAI has come up with such rigid solvency margin because it ensures that the insurers have enough assets to pay all its liabilities off. Even if the insurer becomes insolvent, the Reserve Bank of India will pay policyholders their dues. So, you can keep your worries at bay because your investment with a private general insurer will not be in vain and you won't have to suffer any financial loss. If you are afraid that your chosen insurer might stop operating one day and you will no longer be protected, you should be aware of the merger clause. According to this clause, in case a particular insurer cannot continue to run the business it must merge with another company and keep operating. There is no way that a private general insurer winds up its business and leaves its customers in a spot of bother. Even though there is not much to choose between private and public insurers when it comes to reliability, strength and reputation, a particular sector has the edge over the other for a particular type of insurance product. 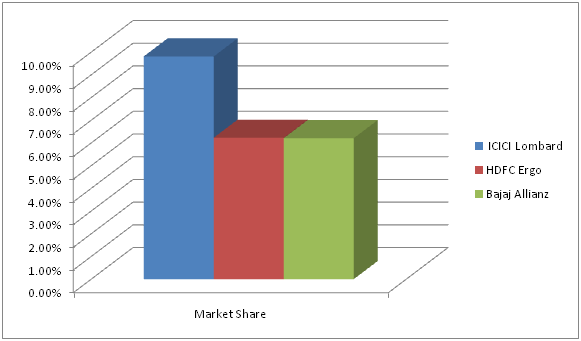 Which Sector is Better for Availing Health Insurance Policy in India? Both private and public sector health insurance companies in India have some upsides and downsides when it comes to health insurance plans in India. Here are some crucial pointers that you should pay heed to in order to gauge which sector is more preferable. Car Insurance in India - Private Companies or PSUs? Similar to health insurance in India, to avail car insurance in India one has to choose between a private insurer or a public insurance house. Both types of insurers come with their own set of merits and demerits. When it comes to health insurance in India, Private and stand-alone health insurers are growing by leaps and bounds as they have been enjoying hefty profits while their public sector counterparts are experiencing huge loss. The net incurred claims ratio of the public sector insurers and private sector insurers in FY 2015-16 were 115% and 69% respectively. Usually, a company with less than 100% net incurred claim ratio is considered as profitable. PSU general insurers such as United Assurance had the highest 122% incurred claim ratio while New India Assurance stood at 115% incurred claim ratio in 2015-16. Private insurers, on the other hand like, HDFC Ergo recorded an impressive below 50% incurred claim ratio. If you don't get your claim approved, whole purpose of being insured is defeated. Hence, you should settle with an insurer with great claim-paying ability. And, spearheads like ICICI Lombard, HDFC ERGO are the front-runners when it comes to claim settlement. Internet usage in India is growing at a breakneck speed thanks to technological advancements and young tech-savvy generation who are adept at making the most of advantages that online transactions offer. Mobile e-commerce, in particular is flourishing in India and online shopping through desktops and laptops are not far behind as well. Since private general insurers are far ahead when it comes to online presence and providing service and products through their own portals and apps, consumers are increasingly turning to companies like Bajaj Allianz, Reliance for their insurance requirements. According to the data from IRDAI, ICICI Lombard leads with a market share of 9.81%. HDFC Ergo and Bajaj Allianz stood at at 6.23% and 6.21%, respectively up to the month of April 2017. So, stats show that private players are coming to the forefront of India's general insurance market. Public insurers are still in demand for their reduced rates and for Indian mindset of trusting government entities. Since all isurers are regulated by IRDAI, you can expect them all to come up with similar standards of guidelines, products and services. Regardless of which sector you finally opt for, you should ensure that the insurance plans that you choose to buy meet your needs perfectly. To ascertain that your chosen insurance plan is the best among similar products you can compare insurance online before buying. You can visit GIBL.IN for easy and fast comparison of insurance policies online and once you pick the best car insurance or health insurance plan for your family you can also buy insurance online right from GIBL.IN.